When we announced we were going to be taking our 6 month old baby to Walt Disney World, a few people asked why we’d include an infant on such a trip? She won’t remember it, they said. We replied that she may not, but we would, and we’d have many wonderful photos to show her when she’s old enough, though in reality she’d likely be taking a nap in many of the pictures. With the trip now behind us we don’t regret it one bit! We have many fantastic memories, and hundreds of photos to share with her in years to come. I think it actually did her good and helped with her social skills too. She met so many new people, made friends and had a fantastic time! It’s by no means easy though! Having been used to visiting WDW (as well as Disneyland California and Paris) many times before, doing as we wanted, when we wanted, staying out late and everything else you do as a carefree adult, it can be a bit of a shock to have the restrictions an infant brings. The key is to go with a totally different mindset. You’re not going to be able to ride all the “e-ticket” rides. You’re not going to be able to stay out late at Pleasure Island. You will have to keep stopping every half hour to feed or change the baby. You may only get a handful of rides done each day. But you will enjoy it. Just relax, take things easy and go with the flow. There’s a secret haven in each park. Somewhere that most childless guests aren’t aware exist. They’re called Baby Care Centers and they’re a lifesaver for those travelling with tots. Nestled away next to the first aid centers, they are somewhere parents can escape to to change, feed or just have a break in quiet air-conditioned comfort. Equipped with highchairs, rocking chairs, changing tables, microwaves, and private nursing rooms. They also stock a range of baby food, diapers, and other baby essentials, but expect to pay a little more than you would in your regular supermarket. The only snag is there is only one center in each park, and if you’re on the other side of the park it can be a bit of a trek, especially with a screaming baby. Changing tables are available in all women’s and some men’s restrooms. Make sure you have some sort of disposable or fold-up changing mat with you, as the changing tables are either stainless steel or marble, which are both cold and hard, and not pleasant for a baby to lie on. A major thing to consider is strollers. Do you take your own or hire one? 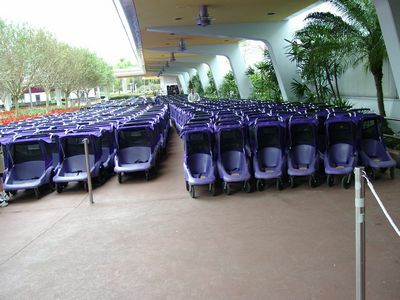 Disney hire out single or double strollers, but have just raised the prices considerably. Singles now cost $15 a day, with doubles weighing in at a whopping $31 per day. If you’re staying for any length of time it would actually work out cheaper to buy a cheap stroller just for the trip. However, most airlines will carry a collapsible stroller for free, in addition to your regular luggage allowance, so just bring one from home. Lightweight umbrella strollers are the best type to use, especially if you intend to use the Disney transportation system, as you’ll have to fold the stroller up on board buses. You can’t take strollers into any rides or wait/queue lines, and a front baby carrier can come in useful here with a young baby. 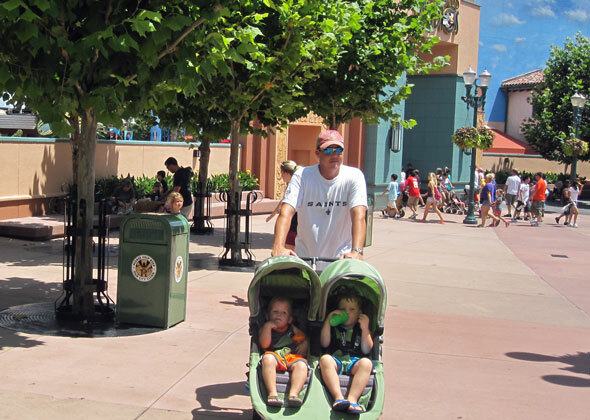 Be aware that where you leave your stroller on entering an attraction may not necessarily be where you’ll find it when you exit. Cast Members often move strollers to a different place or even different area, so don’t panic thinking someone has walked off with yours! Having said that, it does occasionally happen, but there are things you can do to reduce the risk. Write your name on a piece of paper and put it inside your stroller, preferably somewhere visible like a clear plastic pocket if it has one. Tie brightly colored ribbons to it, or anything that make it easily identifiable which will put someone else wandering off with it. Lots of great info in this video as well! So, which rides can you go on with an infant? Well, you are a bit limited but there are still plenty of attractions you can experience. Turtle Talk – With Crush! Playhouse Disney – Live on Stage! If you’re worried about baby crying in the middle of a show, try to sit on the end of a row near the exit for a quick getaway if need be. If you still want to ride the non-infant friendly rides, make use of “baby swap.” Simply enter the queue area as normal, infant too. Tell the Cast Member that you want to use baby swap. When you reach the front of the queue one of you will ride while the other stays with baby. Once the ride is over you simply swap round and the other one rides without a wait. When you book your hotel, request a pak ‘n’ play crib, and request again at check-in. Disney Resorts provide these free of charge. You’ll also find high chairs in all restaurants and food courts. So there you have it, a brief guide to taking your infant of it’s first Disney trip. It requires more work and planning, but is well worth it. Go and enjoy, before that cooing baby grows up and starts demanding to go on small world for the fifteenth time, and wants every plush toy she sees! Another great resource for visiting Disney World resort with and infant, baby or toddler is here! Additionally, this page offers 20 tips for Disney with a baby and my favorite was the advice to buy a stroller cover-up and fan to make your infant considerably more comfortable in the heat, especially during nap-time! They also recommend having a stroller that will lat flat. This entry was posted in Disney World by Nick. Bookmark the permalink. Thank you soooo much for this valuable information. We’re going with our son and we’re so excited but we had little information on what we can do etc. I honestly can’t thank you enough! I’m just trying to sort out where to stay. Can I ask you one thing? Did you ever go to a character breakfast. That’s one thing I”ve alway wanted to do. I have no idea if all resorts do this or it’s just a few select locations. This was great info, thank you! We are heading down in April with our 3 girls (13, 4, and almost 1). I am a little nervous about the 11m old. But your blog made me relax a bit. One question — on the baby swap rides, can everyone wait in line together? Or do you have to wait outside the ride while the riding party waits in line then rides the ride? Yes! Thank you ever so much! My husband and I will be taking our 11 month old tomorrow and this was very valuable information for us! I was wondering how the rides would be and if he would be able to ride, or us for htat matter. You are awesome for adding this! Thanks again! Thank-you, this really help. I’m going in July with my 7yrs, 6yrs and 5 months old. I thought I would just going to sit on the bench waiting while my husband and the other two older kids get to ride. I’m so glad I kno about baby swap. One question? What if I do not want to go on the ride and and my husband can only go on one ride with one kid at a time can they stay in line all together and he go on the ride with one kid and then swap to go again with the other, or does he have to stand and wait in line again? Thank you sooo much for this valuable information!!! I am going with my 1 year old and I was bit worried. I feel much better after reading your blog. Thanks again!!! Thanks for this! My husband and I are vacation club members (thanks to his dad who purchased it in the 80’s) and we’ve gone every year since we’ve been married (8 years) and he’s gone every year since he was 4! We desperately need some time away and wanted to hit Epcot and Magic Kingdom with our 4 month old. We’re not interested in any rides, just to walk around and take in the wonder of one of our favorite places. The stroller tips and baby care centers are very helpful! We had a great time there recently with the kids, and if I’m honest I’m not sure who was the bigger kid lol. Thank you so much for the great info. I planned a last minute Disney vacation for the family. My husband and I, my parents, and my three boy 8, 6 and 6 months. I started to freak out and panic thinking OMG what have I done. I am going to be sitting around all day while everyone goes on rides and shows. I am so glad to now have a list in hand of what we can do. I didn’t know of the “babyswap” I am now less stressed and ready to enjoy our trip. Thanks again for posting this helpful info. Thanks so much! My husband has a conference in Orlando next month and I will be taking my 3yo and my 4mo to WDW alone and was starting to wonder if I should even bother! Your info has confirmed what i was thinking! I’m so excited that I’ll be able to take my 3yo on the rides with my 4mo! They would hopefully allow you to take the stroller into the restaurant if you explain that she won’t be able to sit in a high chair. This was very helpful! My husband was questioning why I want to bring our 6 month old to Disney. I have been going to Disney since I was her age every year. So I want her to have the same experience! Thank you for listing all the rides and the info about the baby care centers and the baby swap. We are all going to have a great time thanks to you! Even though she may not be able to remember her first experience with disney world, I will. And like you said, we will be able to share all the pictures with her in time! Thanks again. Renee M.
Very helpful! We’re getting ready to take our 6 month old TRIPLETS to WDW in May. Many people think we’re crazy too, but I’d rather take 6 month olds than 2 year olds 🙂 I appreciate all of your advice! Thanks for the information, this was very helpful. We are planning a trip with our 9y/o, 4y/o, and 7 month old. Do you know if the shuttle buses require carseats or boosters? We didn’t know if they would transport baby without one. Also, if we stay on Disney property will they provide transportation or do they have a shuttle to Sea World? Thanks for any info you have! I am planning on taking my two grandson’s and I was wondering if you have to pay for the 8 month old and how much is it? Great useful post even years later. Heading down with our six month old tomorrow for a cruise and thought we would stop at Disney for a day. This helps us greatly. why can’t infant go on its a small world ride in magic kingdom and epcot? This blog is just what my wife and i needed to read. Thank you for posting. We are leaving Nov 1st with our 5 month old and were a little nervous. After reading this i think we are gonna have a better time then we thought! We didnt realize that she could go on all these rides with us. ONe question i have is… can she stay in the baby carry on or does she have to sit in between us? I wasnt sure about the lap bars. Thanx again! Would a 3 year old go free, or just under 3? Thanks a lot! This was helpful and encouraging. I have a 6 year old and a baby & now I know how to plan for our trip. We are planning to take our 4 month old in July and i am amazed at how many rides we will all be able to go on. Can we do pirates of the carribean? Really informative article, thankyou. Hi! Do you have to use a baby carrier on the rides for infants like a Baby Bjorn or portable car seat for 6 month old? Or can he sit on your lap? My son will be turning 1 year in September. His father and I want to take him to WDW but wasn’t sure he would be able to enjoy any thing there because of his age. Thank you so much for posting this. People have asked me why would you take him to WDW but after seeing this I know why. Thanks for the info. My daughter is 7 months old today and we are taking her for her first trip to Disney! Also, I forgot to mention. I always stay at the Wyndham Lake Buena vista resort(formerly the Grosvenor) which is considered a Walt Disney world Resort across from Downtown Disney. They offer a character breakfast 3 times a week for much cheaper than any place in Disney. It’s great! 2013 and still a great article to come across! A lot of info I was looking for!! I have to disagree with some of the rides you’ve posted, I don’t think it’s really appropriate for a baby to go on the Great Movie Ride (the aliens part, as well as the gunfire) and babies wouldn’t be able to use the 3d glasses, so why bother taking them on any of the 3d rides? It will just be all blurry and difficult for them to focus on.